Are you into foldables? Well lately, I have been! It’s like I have been having the students create some sort of foldable every week, but you want to know the best thing about it? The students love it! They love doing an activity that is not the same copying from the textbook on notebook paper. Today, I want to share with you one of my recent foldables that is very simple. It’s called the Infant/Toddler Development Chart. 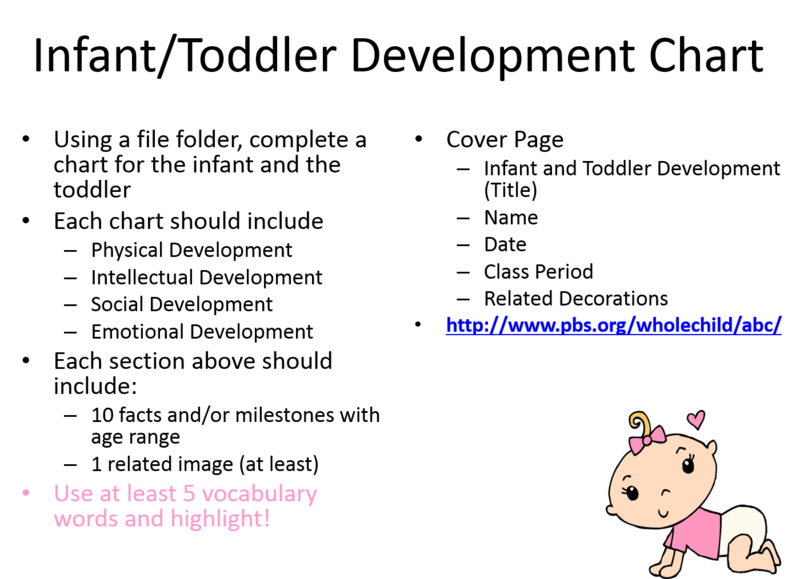 Infant/Toddler Development Student Project Sheet and Rubric-NEW!!! and Editable!! ← Welcome to Techie Tuesday! Do you have a rubric on how you grade the quality of the foldables? How long do you give your students- class periods and at home? Yes, I do have a rubric and I will post it today. I usually give them 2-3 days of class time to work on it. If it is not finished by then, I allow it to be taken home for homework. Personally, I think they get so involved in decorating it which is why it takes 3 days. But I guess that’s a good thing! I can’t find your rubric. Will you lease send it to me? I would love to do this with my students next week. Thanks. Would you please email me a copy of your rubric? I would really appreciate it! Thanks so much! I just uploaded it to the site. Sorry it’s so late, but have been extremely busy working on research proposal. I would love to use your idea but where do I find the rubric? You said you would post it but I can’t find it. Thanks. Is this an in-class or homework assignment? I use it as an in-class assignment. But I’m sure you can use it whichever way works best for you.